SEASOFT Ti PRO EDGE Kevlar Gloves, the glove with the thinner index finger and thumb. • 2 layers of TITANIUM FLAKE FOIL™ for superior warmth! 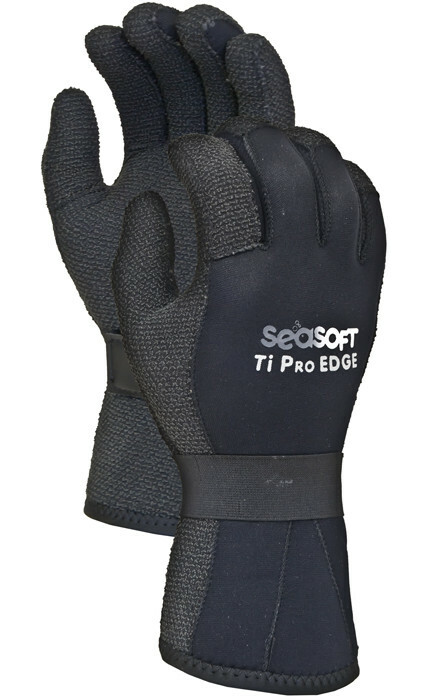 Why should you buy these SEASOFT Ti PRO EDGE™ GLOVES? The SEASOFT Ti PRO EDGE™ gloves are designed with pre-curved fingers, the warmest materials, super tough and abrasion resistant KEVLAR™, TWO layers of Titanium Flake Foil™ for heat retention and up to 60% less seams. The KEVLAR™ covers approximately 75% of the surface area, more than double the amount of most gloves. The amazing thing is that these gloves have a thinner index finger and thumb than the rest of the glove. Photographers, underwater hunters and anyone that wants more dexterity and comfort will love this feature. The 5 mm Ti PRO EDGE has a 3 mm index finger and thumb and the 3 mm Ti PRO EDGE has a 1.5 mm index finger and thumb. Imagine - Warmth and dexterity! Here is another feature missing in most gloves. When water enters our gloves, our body temperature should warm up the water and keep our hands stay warm. BUT if your gloves are constantly flushing this warm water out and replacing it with cold water then you eventually get cold hands! The SEASOFT Ti PRO EDGE™ gloves minimize this flushing action by eliminating the seam across the palms that other gloves have. This does away with the main avenue for this flushing motion. Most of us though are looking for a really TOUGH glove, well, this is it! This glove is simply made of the best materials. Thicker thread, better glue, a higher quality neoprene, the kind of attention to detail that SEASOFT is famous for! These gloves reflect that quality!